AMERICAN and German War Departments announce simultaneously new rays capable of “seeing” enemy aircraft through fog, clouds, or dark, at distances of up to fifty miles. First tests in this country are being held at the Lighthouse Station near Highlands, N. J., by the War Department, the details of the invention being closely guarded by military police. No larger than a penny match box is the German mystery ray machine, a highly-perfected ultra-short wave radio transmitter. 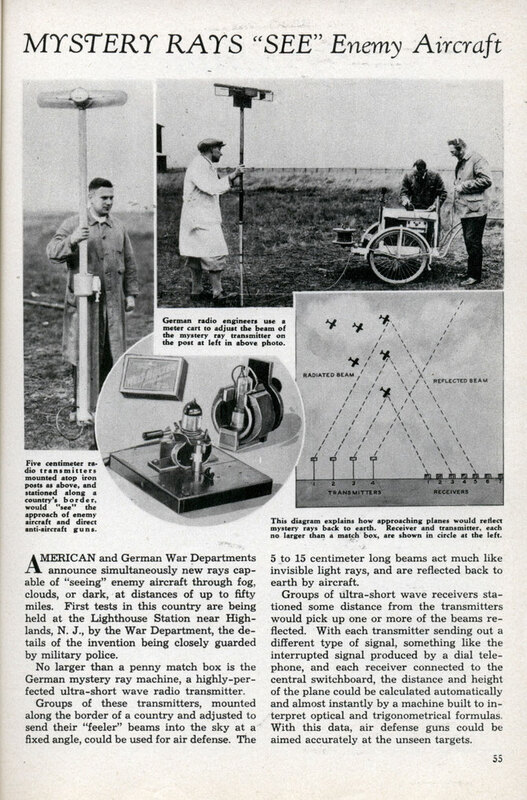 Groups of these transmitters, mounted along the border of a country and adjusted to send their “feeler” beams into the sky at a fixed angle, could be used for air defense. The 5 to 15 centimeter long beams act much like invisible light rays, and are reflected back to earth by aircraft. Groups of ultra-short wave receivers stationed some distance from the transmitters would pick up one or more of the beams reflected. With each transmitter sending out a different type of signal, something like the interrupted signal produced by a dial telephone, and each receiver connected to the central switchboard, the distance and height of the plane could be calculated automatically and almost instantly by a machine built to interpret optical and trigonometrical formulas. With this data, air defense guns could be aimed accurately at the unseen targets.